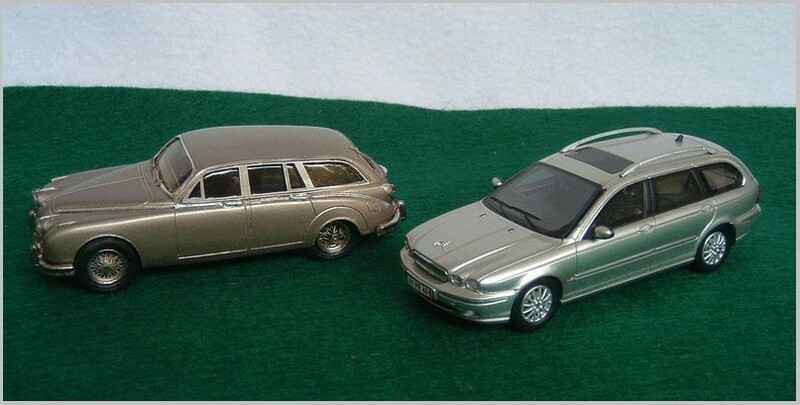 A brief history of Jaguar Station Wagons: some in 1:43 scale. Station wagons have always been part of the motoring scene in Europe although perhaps not as large a part of the market as they were in the USA from the early 1950s to the 1980s when mini vans and SUVs and more recently crossover vehicles began to displace them in popularity. In England in the 1930s there were custom built station wagons which the English called ‘Estate Cars‘ due to their popularity as utility vehicles on and around country estates, or in some cases Shooting Brakes which were designed to carry shooting parties to the shoot with their guns, ammunition, and refreshment. These were often wood framed body conversions on a production chassis. Woodies in American lingo. There were such conversions on Rolls-Royce, Bentley, and even Allard cars not to mention the more common Fords such as the Ford Pilot. Like in the USA these were often built by speciality body builders making for quite a variety of styles over the decades. The Morris Minor Traveller, a wood bodied estate was an in house project and was made by BMC and British Leyland from 1953 to the end of production in 1971 and it may well have been one of larger volume longest running estates, production wise. By the end of the 1950s, all metal wagons became the norm and BMC produced some of these such as the Morris Oxfords and Austin Cambridge. Others from their rivals included Ford Consul (body conversion by Farnham) and Vauxhall Victor and Cresta PA, (body conversion by Friary and in some cases Grosvenor). Others built estate cars in house like Rootes Group whose Hillman Minx and Hillman Husky were factory built and Standard Triumph whose Standard Vanguard and 8/10, Triumph Herald, and Triumph 2000 ranges all offered factory built estate cars. 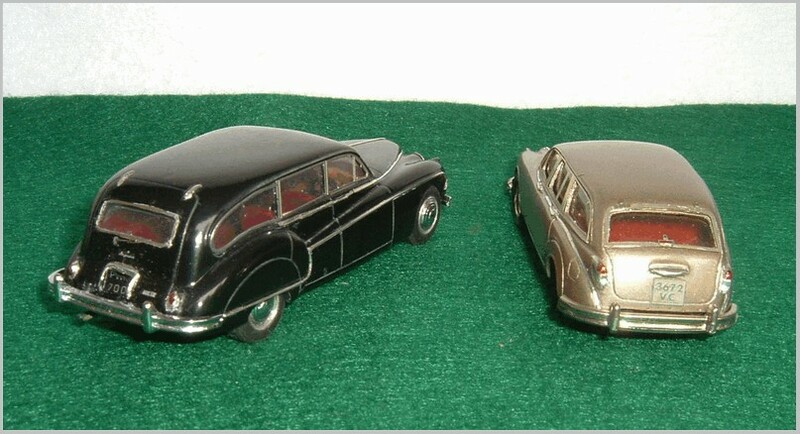 All these were lower line, or mid line, family cars where the estate car market was larger than the market for estate car versions of luxury cars. Jaguar being an up market product left the limited demand for wagons to speciality builders who often did only a handful for specific (and well healed) customers. A little research on the Jaguar side shows that there were estate car conversions of the Mark II, Mark IX, and others such as the Lynx Eventer shooting break conversion on the mid 1980s to 1990s XJS and during the same era there was the Ladbroke-Avon conversion of the Jaguar XJ6/XJ12 Series III sedan. Compared to the XJ40 estate wagon prototype and conversions, the Series III did not lend itself as well to an estate modification. Its wide C pillar and slopping deck lid made for a bit of a strange look for the wagon. Its rear hatch with the oversize window seemed awkward as well as the large trapezoidal shaped rear side window. The next generation of Jaguar saloon (the XJ40 body) was the base for some better looking and handsome estate conversions and it is known that two were built, designed by Chris Humberstone of Chris Humberstone Design Ltd. in 1988 for Hatfields of Sheffield and apparently a third one was built for an American customer and has been seen at some club events. The XJ40 conversion comes off as a better more integrated design than the Series III. The Series III retained the dual fuel tanks although with relocated fuel fillers. The entire conversion was in metal without any use of fibreglass panels. There was a also an official Jaguar XJ40 estate prototype built which never went into production. Quite handsome, it differed from the others in the D pillar area and rear hatch. In silver with lattice wheels it escaped a prototype destruction has been spotted at the Lincolnshire North Jaguar Enthusiasts Club events in the UK and differs in colour from the Humberstone designed one often seen in dark blue with lattice wheels, or wires wheels on the LHD version. Going back to the XJS this conversion was done by Lynx Engineering who were formed in 1973 in Sussex and were known for C and D Type replicas and a few XJS convertibles before Jaguar got in the business for the USA 1989 model year. After their XJS convertibles, Lynx did have another variation on the XJS theme and this was the Eventer which was a shooting break conversion with a large rear hatch giving access to a long flat floor to accommodate luggage or whatever one puts in a shooting brake. All together Lynx produced about 67 of these, 52 in pre-facelift style and 15 post facelift, 18 left hand drive and 49 right hand drive. And just a few were made using the AJ6 six cylinder engine. The prototype of the Eventer was shown in 1982 and the last production was in 2002. The Mark II station wagon, of which only one was made, known as a County, was produced from an idea by Mike Hawthorn who commissioned coach builders Jones Brothers to undertake the conversion. Unfortunately the car was only finished following his death. It became known as the MK II Country. Jaguar ended up using the car as fast assistance car for the factory racing saloons. I also include a Mark IX conversion which although billed as a hearse it could well pass for a station wagon with some re-configuring of the interior. Fairly attractively modified from the sedan and devoid of an exaggerated raised roof it could have doubled as an estate car. It was an early example of a car with a hatchback. Details of the maker of this conversion are not readily available but it was produced before Jaguar’s launch of the Daimler DS420 cars which were loosely based on some of the mechanicals of the Mark X saloon. Being a much larger car it was more suitable for a conversion to a hearse and there were many various conversions done over this car’s long production run. And finally, there is Jaguar’s first in-house production wagon, the X Type, the first Jaguar designed by Ian Callum and launched a few years after the saloon version. Known as the Sportwagon in the USA it was not a big seller but was notable as the first true Jaguar production wagon. A pity, as it seemed a useful and well-designed variation of the X Type but it carried the same Ford Mondeo stigma as the sedan. In the ever comprehensive world of 1:43 scale models each of the above mentioned cars have been replicated in miniature either in the past or currently. The earliest being the Mark IX which was done by two model makers, the French company Provence Moulage as a resin kit and as a fully built model by Milestone Miniatures in white metal. Both are rare and long out of production. Provence Moulage also did the Mark II County as a resin kit. Moving to more recent items the Ladbroke Avon Series III XJ wagon is a product of Matrix scale models www.matrixscalemodels.com It was produced in pale primrose or light metallic blue and also has some chassis detail. However, these resin collectable replicas are produced in limited production numbers (albeit greater that the real car) and would now only be available on the secondary market. The Lynx Eventer was done a number of years ago in resin as a kit by Provence Moulage in France. It came with BBS type accessory wheels, left hand drive and decals for the bonnet and hatch. The more recent Eventer was a Premium X model in a dark metallic blue, right hand drive and a biscuit interior. A fair amount of chassis detail is also provided. Wheels are the “starfish” type. Judging by the weight this item metal diecast. Interestingly, Matrix also did an Eventer, in light metallic blue but this one is a resin item. The pictured Mark II County is a long obsolete built kit by Provence Moulage but more recently Matrix, who often seem to find rare and unique Jaguars to replicate, have produced a black County in resin with disc wheels. Certainly the Matrix version would be easier to find currently. 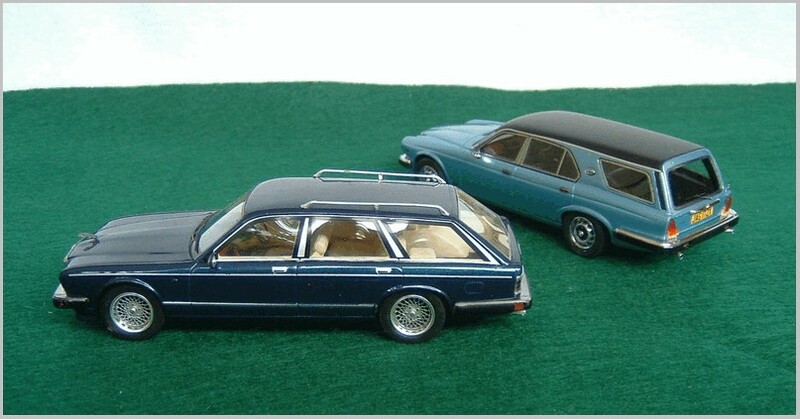 Going still more modern we have the circa 1988-1990 XJ6 wagon in dark metallic blue produced in miniature by NEO scale models. http://neoshop.replicars.nl/index.php. At this writing this model is currently available. 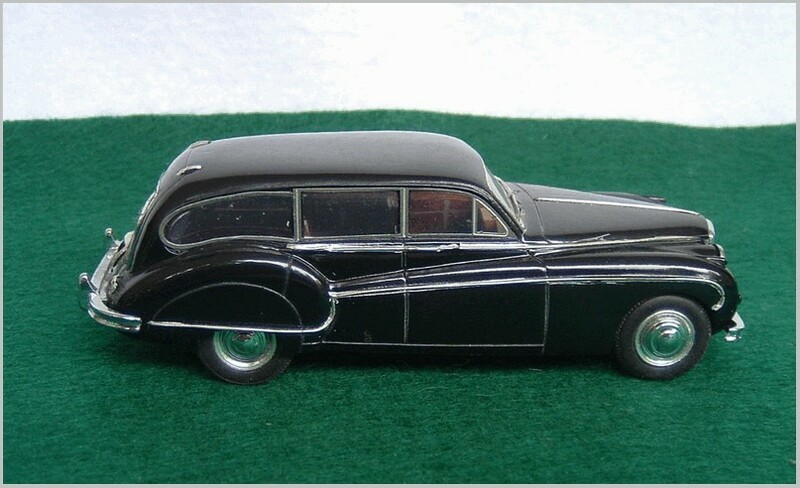 And finally, we have a replica of the first production Jaguar wagon, the X Type Sportwagon. This one was done by Premium X under their number PR095 in silver with left hand drive and even a tiny leaper on the hood, and some chassis detail showing the dual exhaust systems and suspension. The interior is two tone black and grey. Although not truly a station wagon there is already a replica of the F Pace produced in 1:43 scale and model collectors eagerly await one of the Chinese based model makers to launch an XF Sport Break in 1:43 scale. Will it be NEO, Matrix, or Premium X all who have all done multiple Jaguars in the past?